President Barack Obama is a good fellow at work in a difficult era, to say the least. So this post is not intended to be a slam on the president. Still, it is a good idea for Obama to be much more cautious when he draws from conventional wisdom, and the word of aides, to publicly express his view that a big energy sector is safe. You’ll recall that on March 31, 2010, President Obama announced the government would open much of the Atlantic coastline and the eastern Gulf of Mexico to oil and gas exploration, deeming the benefits to the economy and security higher than the risks. Three weeks later the Deepwater Horizon exploded, releasing a torrent of oil into the Gulf. Then in January, the president called for tripling public financing for new nuclear power plants in the State of the Union, and in public statements before and afterwards cited Japan’s long record as evidence that nuclear-generated electricity was safe. Seven weeks later, after being struck by an earthquake and tsunami, Japan’s 4,696 mw Fukushima Daiichi nuclear plant is completely destroyed and leaking life-threatening levels of radiation. The Telegraph is reporting that Japan was warned about the vulnerability of its nuclear plants and that “an official from the International Atomic Energy Agency (IAEA) said in December 2008 that safety rules were out of date and strong earthquakes would pose a “serious problem” for nuclear power stations,” in Japan. 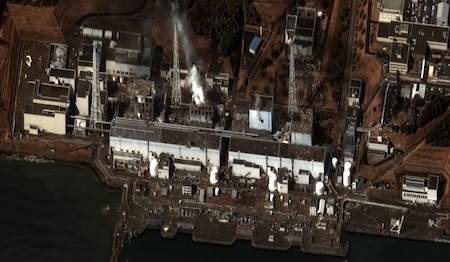 The Fukushima plant, by the way, is the 27th largest power generating installation in the world, the 12th largest nuclear station globally, and the second largest nuclear plant in Japan. It’s also one of the oldest nuclear plants in Japan.